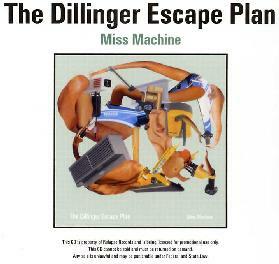 The Dillinger Escape Plan - "Miss Machine"
The band has moved quite a bit forward since the debut in 1997. This is the bands fifth release and the first since their work with Mike Patton. The band have not held anything back on this release and let their aggression flow out full force. The 11 songs here (are split into 99 tracks to prevent MP3 ripping!) are mostly high speed complex aggressive songs. The band reminds me a lot of a more aggressive, non-humorous Mr. Bungle with some complex speed metal thrown in. I think if you liked their previous work, this one will get you off as well!